Alex has been ill this week; not just a little bit ill, but ill enough to be taken to children’s A&E by ambulance on Friday, and it’s given me an almighty fright. Because when your kid is ill, you realise just how small and vulnerable your little ones are, just how precious their health is, how quickly things can deteriorate, and how much they need you. We’re slowly coming out the other end of this illness stricken seven days or so, but it’s been one heck of a week. It started last Monday, when I got a phone call from John, informing me that nursery had called to pick up Alex early, as he had come down with a high temperature and was just not being himself. I was away on an overnight trip with work, and I can’t say that it came as a surprise. Firstly, because it’s Sod’s law, and just my luck again that Alex would fall ill the exact time I had to be away with work and it’s the worst possible timing, but also because only a couple of days earlier, on the Thursday, I had already taken him to the doctors surgery to be checked out, as I was worried about his increasingly nasty sounding cough. I was told at the time that it was viral, and that we had to ride it out (seemingly the standard answer for everything). I was unable to get home until the next day, but John was sending me regular updates, and I knew that the kids were in good hands with their Daddy. Still, I worried, as not being there when your child is ill and needs you, is a horrible feeling. Oh the guilt you feel as a Mummy! The next morning John told me that Alex had had a terrible night, changing between being agitated and whiny to just floppy and lethargic, and his temperature had hardly gone down, despite doses of Calpol and Ibuprofen. I finished what I had to do at work and set off for home early, craving to be with my son. When I arrived home, he immediately crawled into my arms and cradled himself into me, and pretty much stayed like that for the rest of the day. John said that he had been the same with him all day, and that he had just been drifting off to sleep on and off, with a continuous high temperature. 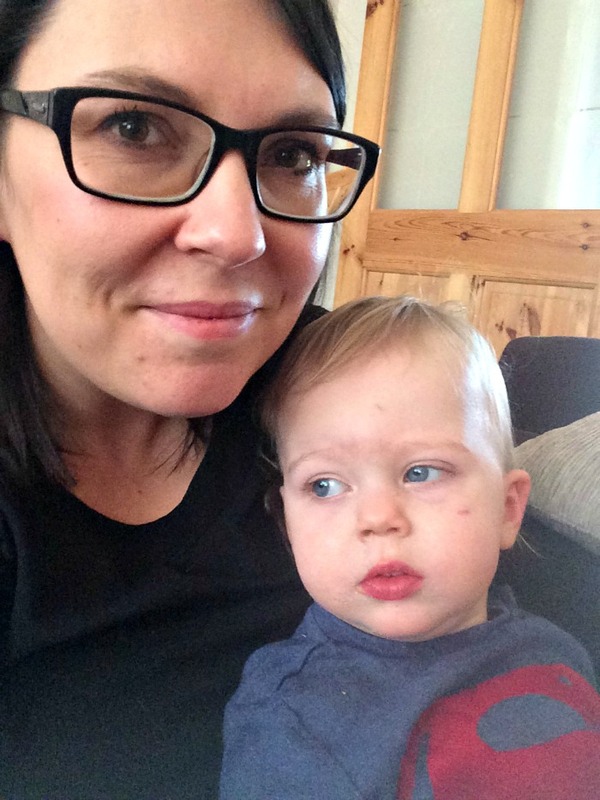 The next morning I took him back to our GP, who acknowledged how ill he looked – by that point he was mostly floppy and lethargic, with pale skin and sunken eyes though bright red cheeks from the temperature – and diagnosed with a bad case of tonsillitis. We were sent on our way with Penicillin, and assured that once this kicked in, he would feel much better. Over the next couple of days Alex continued to sleep a lot and alternate between lying on me, snuggling into me, or just clinging onto me. His temperature continued to be high, hardly ever dropping below 38 degrees and staying mostly above 39 degrees, peaking at 40.2. Just wanted to cuddle and sleep. By Friday morning, after another rough night, he was boiling up and was completely floppy and dispondent. He hadn’t eaten any solids since the Monday, and it was hard work getting any fluids or even Calpol into him, so I rang the surgery and asked to be seen by another GP again, especially as by then he had already been on the Penicillin for two days with no signs of improvement. We got called in an hour later, and the doctor seemed immediately quite concerned as his heart rate was above the norm and his oxygen levels were low with laboured breathing. She said that she’d like him to be checked out by the children’s hospital, as she thought she could hear some noise on the right side of his lung. I agreed that we would take him down asap, but she said that she would actually call an ambulance straight away, as she suspected he had pneumonia. Now, I don’t know what I had expected from the GP visit, some different medication maybe, or reassurance that it wasn’t as bad as it looked, but certainly not being rushed to children’s A&E in an ambulance! The ambulance arrived within ten minutes or so, and I had to lie down on the stretcher with Alex on top of me (who was just drifting in and out of sleep and was pretty unresponsive to all the commotion). I’m not going to lie, at this moment I was scared. Really scared. Because my little Alex was so vulnerable. He seemed so small and fragile. Because there was nothing I could do to make it better for him, and I would have done anything! And because I didn’t know what would happen once we got to the hospital. And because I had never been in an ambulance before, and the whole sterility of the place, the cables and medical apparatuses were really frightening (though the three paramedics who came to deal with us were absolutely lovely and very calming). John arrived a few minutes later, having followed us in the car, and then we waited to be seen by the team there and examined. After five hours in A&E and various tests, we were told that it wasn’t pneumonia after all – thank God! 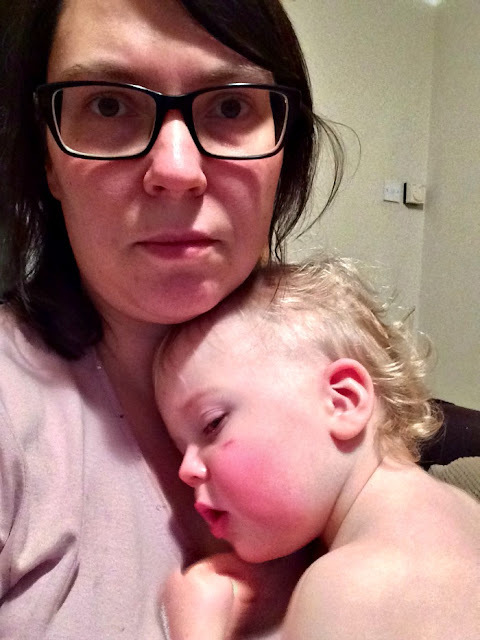 – but “just” an infection with a very severe case of tonsillitis (apparently his tonsils were huge and red raw), both of which fused and made Alex so ill. We were given some additional medication to administer and allowed home. 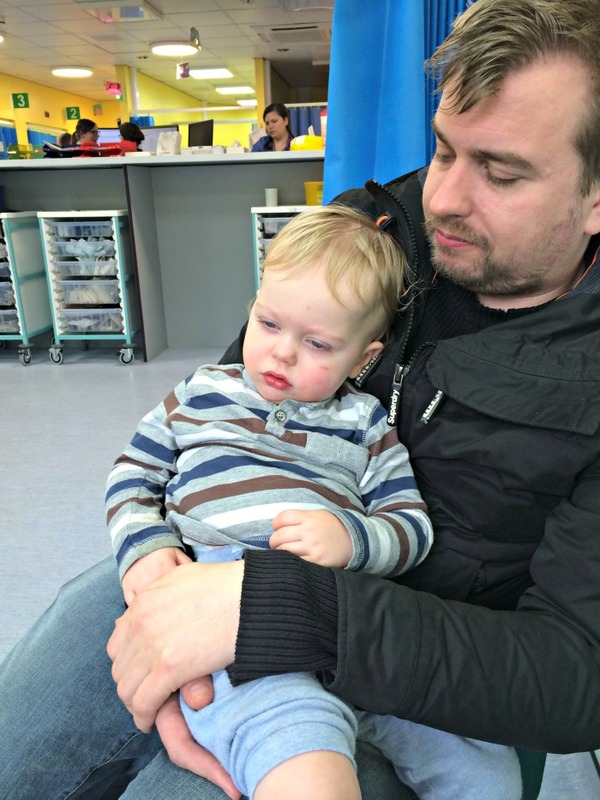 With Daddy in Children's A&E. It was such a relief to know that he would be ok and that we didn’t have to stay in hospital. We’ve continued to give him lots of rest, lots of fluids, and lots of cuddles, and since yesterday afternoon we have managed to get a handle on the temperature and he’s starting to make a recovery. He still looks weak and his cough is still bad, but hopefully we’re over the worst. It’s been a funny old thing being needed so much. 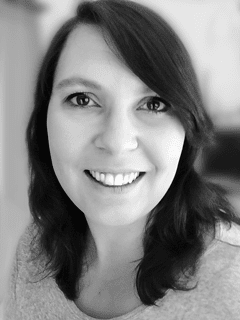 It makes me worry about my kids, but also worry about myself, because I’ve realised just how much they need me. And I’ve realised that I need to look after myself, too, because I have to be there for them, no matter what. And as much as I wish Alex hadn’t been this ill this week, it’s also brought us even closer. He wasn’t only snuggling into me and sleeping on me, but during those moments when he felt a little better, he also kept hugging me and giving me kisses, almost as if to say “thanks for looking after me, Mummy”. And that was just so lovely and so precious. I’ve been so overwhelmed with my love for him, and the thought that something could ever happen to him, or Becky, really terrifies me more than ever. But that’s motherhood - overwhelming love, mixed with overwhelming fear. Because suddenly, you have so much more to lose than ever before.